By now you probably know our Healthy Living chicken recipes are winners all. But this how-to video reveals it in stunning step-by-step detail. Cook pasta in large saucepan as directed on package. Meanwhile, combine cracker crumbs, Parmesan cheese and oregano in pie plate. Lightly beat egg white in separate pie plate. Dip chicken in egg white, then roll in crumb mixture until evenly coated. Set aside. Spray large nonstick skillet with cooking spray. Heat on medium heat. Add chicken; cook 5 min. on each side or until cooked through (165ºF). 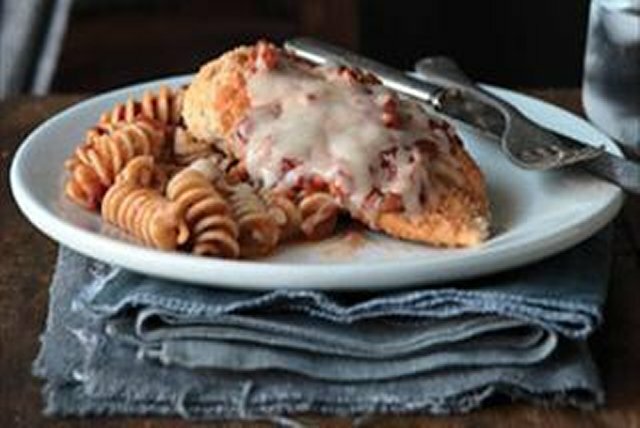 Spoon 1 cup of the pasta sauce over chicken; top with mozzarella cheese. Cover skillet with lid. Reduce heat to low; simmer 3 min. or until sauce is hot and cheese is melted. Meanwhile, drain pasta; return to pan. Add remaining 1 cup pasta sauce; toss to coat. Cook on medium heat 2 min. or until heated through, stirring occasionally. Spoon onto serving plates; top with the chicken. We coated a hot skillet with cooking spray and cooked the chicken until crisp instead of frying it in oil like traditional recipes. This small change plus using reduced fat mozzarella cheese will save you 100 calories and 13 grams of fat, including 2.5 grams of saturated fat, per serving.